On the 26th and 27th February 2014, the group hosted its first workshop, which assembled together a multi disciplinary audience of geological, biological and oceanographic researchers and industry specialists with the aim of identifying key knowledge gaps and science opportunities related to ferromanganese crusts. The findings of the workshop and the network which develops will now form the foundation to a NERC Research Programme grant application. A list of attendees of the upcoming workshop can be found here along with the workshop agenda. 1. Understand E-tech element cycling and concentration in natural systems. 2. Understand how to predict and mitigate the environmental effects of extraction and recovery of E-tech elements. These goals will be achieved through coordinated research projects targeting novel research into high priority E-tech elements, their environmental context and wider implications of their extraction and recovery. The programme will develop an interdisciplinary community building on UK strengths, linking to industry and related international activities. To enable further collaboration, NERC employ The Environmental Sustainability Knowledge Transfer Network in order to provide a common focal point where those with an interest in this programme can connected as well as explore current activities. Should you wish to follow activities within the E-tech element potential of submarine ferromanganese crusts group please click here which will direct you our portal within the Knowledge Exchange project web site. On the 1st September 2013 the NOC, in collaboration with the BGS, was awarded one of 13 Catalyst Grants. The main objective of this collaborative research is to establish a consortium to identify the parameters that control the formation, distribution, abundance and concentration of seafloor E-tech-metal-rich ferromanganese crusts, the potential environmental impacts of their extraction and the key challenges in resource recovery, to inform a full 'Research Grant' submission. We will focus particularly on the processes that enhance the concentration of cobalt, tellurium, selenium, REE, Nb and PGM in the crusts and explore the potential physical and chemical effects on the environment caused by their extraction. Our proposal will address a novel and new supply source of E-tech elements such as tellurium from a marine resource perspective. it will engage with the off-shore survey, mining engineering industry as well as researchers in biology, geology, oceanography and marine chemistry. Only through a holistic multidisciplinary approach are we able to access the viability of this resource and its potential environmental impacts. 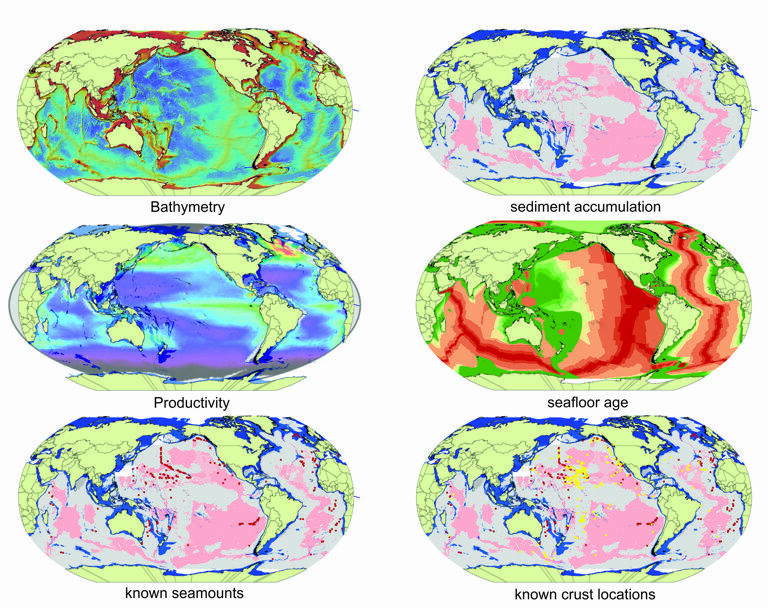 Tellurium is enriched in Fe-Mn crusts (or otherwise known as Cobalt crust) in the deep ocean by almost 10,000 times compared with continental crust. It is one of the E-tech elements that are considered critical to the emerging high-tech industries and the 'green' economy. For example, the renewable energy sector identifies a sufficient and secure supply of tellurium as the single largest barrier in its development and production of CdTe photovoltaic devices. These are the only thin film photovoltaic technologies to surpass crystalline silicon photovoltaic devices in both cost and efficiency in the provision of megawatt PV systems. Currently, the UK and European economies are strongly dependent on imports of strategic E-tech metals such as tellurium from politically and/or economically unstable countries (e.g. Zaire); a fact recognized by the European Commission in the priority given to the investigation of strategic mineral resources in European territories, including the seabed (European Commission, Horizons 2020). There is no primary source of tellurium. Its major supply is through by processing of copper ore from Zaire, which remains the major global supplier. Our proposal is also aimed at assessing potential environmental impacts to ensure any future development of marine resources is sustainable and responsible. For example, our research will provide new and important information on the composition and evolution of sea floor metal-rich crusts and hence their potential environmental impact on adjacent ecosystems if they are mined. 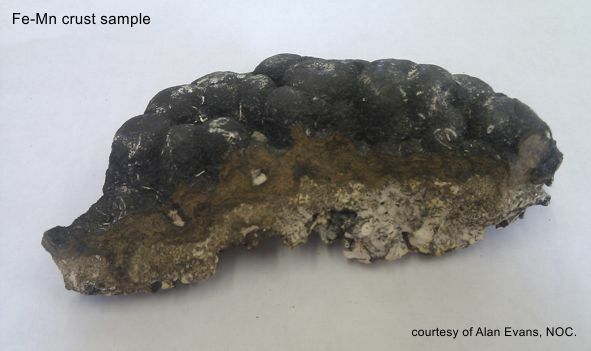 Ultimately, results from our research will enable informed decisions by non-governmental organisations and policy makers scrutinising the sustainability of future extraction of metal rich crusts on the sea floor. For example, this research is identified as a priority in the new ten-year science plan for InterRidge, which has observer status at United Nations International Seabed Authority, and of which the principal investigator of this grant, Dr Bramley Murton, was chair (20010-2013). The importance of the environmental impacts is recognised by the current EU Framework 7 call on assessing potential environmental impact of deep-sea mining as well as in current draft legislation for the EC Horizons 2020 research framework. We will review the current state of knowledge relating to Fe-Mn crusts and their E-tech element geochemistry (through collation of public domain data and information via a literature review and liaison with a network of companies and global experts). Develop a preliminary descriptive and genetic model for Fe-Mn crust formation based upon existing research and discussion with key experts. Identity the key knowledge gaps and prioritise areas for future research and assess the availability of spatial datasets (such as: bathymetric maps, active spreading centres, proximity to hydrothermal activity, geology, substrate ages, sedimentation rates, current maps, etc.) relevant to future prospectivity mapping. 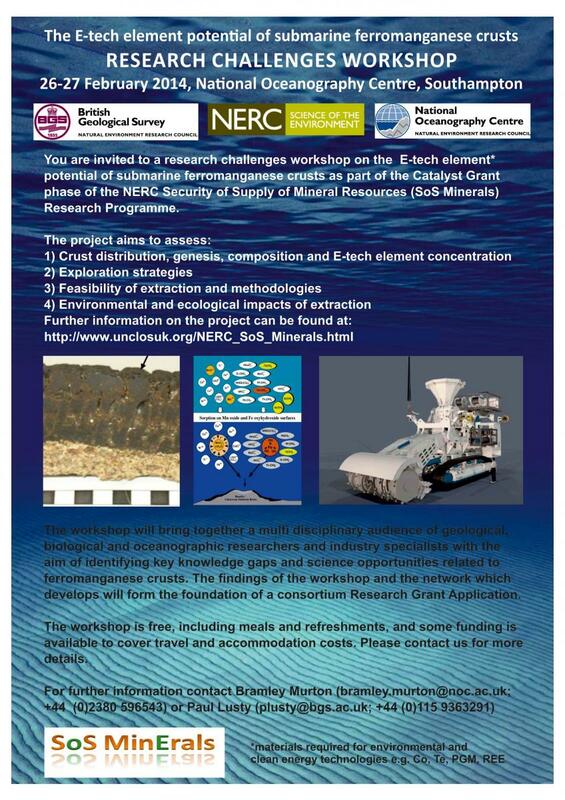 For further information of our Catalyst Grant or whether you have an interest in becoming a partner for the Research Grant phase, or merely have any other query relating to minerals of the deep sea floor, please contact either Dr Bramley Murton or Alan Evans.